“First Monday in October:” A Pre-View of the 2011-2012 United States Supreme Court Term, is sponsored by the Department of Political Science, Cunningham Memorial Library, the Foundational Studies Program, and the Center for Community Engagement. Robert Van Sickel, associate professor of political acience and director of the legal studies program, discusses the controversial issues facing the Roberts Court in 2011 and 2012. C-SPAN will visit the ISU campus Today (Friday, Sept. 30) in conjunction with a live broadcast from the Eugene V. Debs Home for an installment of “The Contenders.” The new original series focuses on past presidential candidates who lost the election but still changed history. This evening’s episode will focus on Debs, a Terre Haute native and five-time presidential candidate. A viewing party is scheduled for 7:30 – 10 p.m. in the Cunningham Memorial Library Events Area. Faculty, staff and students are invited to tour the C-SPAN “Campaign 2012” bus from 2 – 4 p.m. on Dede Plaza and/or from 7-8:30 p.m. outside the library. Entry forms for this year’s Letters About Literaturecontest are now available on the Indiana Center for the Book’s website. The national reading-writing competition, sponsored by the Center for the Book in the Library of Congress in partnership with Target Stores, calls for entrants to write a personal letter to an author, living or dead, from any genre (fiction or nonfiction, contemporary or classic, etc.) explaining how that author’s work changed the student’s way of thinking about the world or their self. As in previous years, all state semifinalists are invited to attend an annual awards ceremony featuring a notable young adult author. State contest winners will receive a cash award and plaque from the Indiana Center for the Book during a summertime awards ceremony. Top winners also receive a Target GiftCard and advance to the national level competition. National prizes include a $10,000 LAL Reading Promotion Grant for the community or school library of the winner’s choice. National winners also receive a $500 Target GiftCard. National honorable mentions will each receive a $100 Target GiftCard and a $1,000 LAL Grant for the library of their choice. Visit lettersaboutliterature.org for contest updates and valuable teaching materials, such as lesson plans, writing samples, assessment checklists, and teacher tips. Letters About Literature is open to legal U.S. residents enrolled as a student in grades 4 -12 during 2011/2012 school year. Entries must be postmarked no later than January 6, 2012 for consideration. The Writing Center will offer its first writing workshop this Thursday (Sept. 29) at 4 p.m. in room 028 of the Library. The topic is APA, and the session will cover formatting an APA essay and abstract, as well as how to format citations. This workshop lasts 45 minutes and will include a brief lecture and time for students to work on citing. Writing workshops are open to everyone, and proof-of-attendance slips will be provided. Seating is on a first come, first served basis. For more information, email Nicole.Bailey@indstate.edu. ALA banned books bookmarks have been localized with stickers and will be given to everyone who checks out a book this week. The 1st floor display area has 2 cases devoted to Banned Books Week. Several classes will be meeting on Thursday, 11am-12:15 in the Events Area to discuss censorship and intellectual freedom; Library people are invited to attend. *The Fall Read has been The Freedom Writers. Students have been asked to read an article which discusses the attempt to fire a Indiana high school teacher who assigned the Freedom Writer’s Diary to her 11th grade class. Margaret G. Robb, chief justice of the Indiana Court of Appeals, will deliver a Constitution Day address Monday (Sept. 19) at Indiana State University. Robb will speak at 1 p.m. in the John T. Myers Technology Center, Room 105. Her presentation, “The Constitution – Why We Care,” is intended to help ISU students gain a greater understanding of the state and federal constitutions and America’s legal heritage. Constitution Day activities, including Robb’s presentation, are free and open to the public. Robb was appointed to the Court of Appeals in 1998 by Gov. Frank O’Bannon. 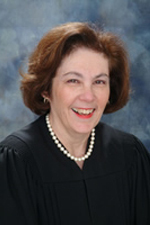 She is currently the presiding judge of the Fifth District as well as the court’s chief judge. She chairs the Indiana Supreme Court’s Task Forces on Family Courts, the development of trial court local rules, and she is involved in several projects on behalf of the Indiana legal system. Prior to her appointment to the court, Judge Robb was a general practice attorney in Lafayette, served as a bankruptcy trustee, as a deputy public defender in Tippecanoe County and as a registered family and civil mediator. Elected chief judge last fall, she is the first woman in the appellate court’s history to hold the position. Judge Robb was the founding chair of Gov. Otis Bowen’s Commission on the Status of Women, a recipient of the 1993 Indiana Bar Association’s Celebrating 100 Years of Women in the Legal Profession Award, and the 2005 Women in the Law Recognition Award from the Indiana Bar Association. The New York Times investigative reporter, Edwin Black, will be speaking on campus Thursday, Sept. 22 from 2-3:30 p.m. in the events area of the Cunningham Memorial Library. His talk, “Nazi Nexus-Corporate Complicity in the Holocaust” is based on his book: Nazi Nexus-America’s Corporate Connections to the Holocaust. The event, sponsored by CANDLES Holocaust Museum, the Department of History and Interdisciplinary Programs, is free and open to the public. OLLI at Indiana State University would like to invite you to a free lecture we have offered this week. Please see details of the programs below. If you would like more information about OLLI at Indiana State University, please contact Michelle Bennett at X2336 or michelle.bennett@indstate.edu . From the moment Dorothy Jerse moved to Terre Haute she became a fan of the city and its citizens. In the intervening decades she has distinguished herself as a local historian by writing numerous books as well as weekly columns for the Sunday edition of the Tribune Star. Most recently, her wide range of interests was demonstrated by three articles in Terre Haute Living. Dorothy has also served on many local boards and was a former curator of the Vigo County Historical Society and executive director of the Terre Haute YWCA. An open session with Mr. Gregory Youngen, candidate for this position, is scheduled for 2:15 – 3:00 p.m. on Wednesday, Sept. 21 in the Library Events Area. Youngen will give a presentation for 30 minutes, with 15 minutes for questions from the audience afterward. Questions regarding the search may be directed to the chairperson of the search committee, Cinda May, at 237-2534. 1995 – Present Associate Professor, Library Administration. University of Illinois at Urbana Champaign. 1982 Bachelor of Science. Indiana State University, Terre Haute, Indiana. Major: Journalism, Minor: Library Science. Reference Sources in the Sciences (LIS 412). University of Illinois Graduate School of Library and Information Science. Spring Semesters 1996, 1999 & 2002 (approx. 20~25 students each semester). Taught the full semester course on reference material in science, technology and medicine, including overviews of scientific communication, the publication process, and future trends in scientific publishing. Revised the existing course syllabus and instruction book to include Internet information sources (’96) with additional updates (’99 & ‘02). Science on the Internet (LIS 250G/390G) University of Illinois Graduate School of Library and Information Science. Spring Semesters 2003 and 2005 (23-25 students/class). A 3-credit hour undergraduate course on the nature of scientific information and communication, the basics of online searching (focusing on internet search engines), and the scientific, technical and medical information available electronically. _______. (2006) “Crystallography.” In Literature Search Strategies for Interdisciplinary Research: a Sourcebook for Scientists and Engineers, edited by Linda G. Ackerson. Lanham, Maryland: Scarecrow Press. Chapter 2, p. 34-64. Youngen, Gregory K., Jessica Page, Heather Moberly and Barbara Hamel. (2011). “Identifying and Analyzing Interdisciplinary and Inter-Institutional Research at U.S. Veterinary Colleges.” Medical Library Association Annual Conference, May 15-18, 2011. Minneapolis, MN. $39,800 from the U.S. Civilian Research & Development Foundation for the Independent States of the Former Soviet Union and the Moldovan Research and Development Association. (2001) Served as U.S. Principal Investigator for the creation of a scientific publications database for Moldovan researchers (http://www.mir.acad.md/). The database provides an automated system of communication for the preparation, publication, dissemination, archiving and editing of scientific publications created in Moldova. An additional award of $38,000 for the continuation and expansion of the project was issued by CRDF in March 2003. $6,100 from the Illinois State Library and Lincoln Trails Library System (2008-2010) for a statewide, multi-type library usability test of WorldCat Local. The survey includes onsite test administration, online survey polling, and holding several regional focus group feedback sessions. Initiated and helped coordinate the UIUC Library’s Forum on the Future, (October 27-28, 2000) a conference on electronic publishing. Personally raised over $12,000 in conference sponsorships, helped contact potential speakers, assisted in coordinating meeting logistics, and establishing meeting goals and priorities. The Forum featured 13 nationally prominent speakers representing librarians, publishers, vendors and scholars. Over 175 information professionals attended.